With the enormous rise of social media, the buying process and the role of the Sales Professional have been permanently changed. Canvasses, cold bubbles and mass advertising has had its time. Approximately 90% of decision makers state that they are not responding to cold acquisition, 75% of B2B buyers prefer to work with someone from their own network and the first phase of the traditional sales process takes place completely online; the vendors are called in as late as possible. As a result price pressure. Today's client asks for a different approach: less pushy and more content. We will have to look into the customer in advance; what are his problems, challenges and opportunities and how can I help him with that. 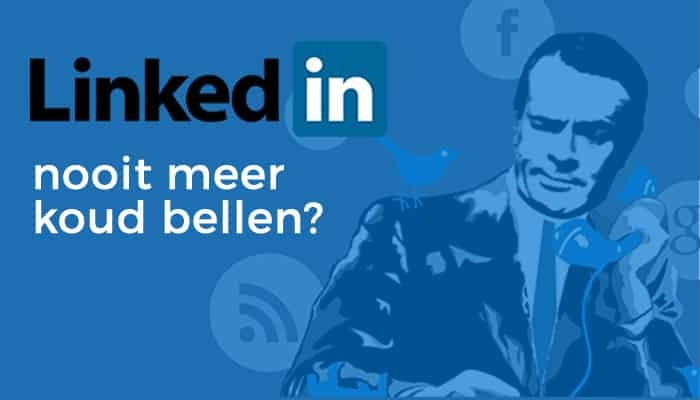 We have to listen to our customer and that is possible through the right use of social media, including LinkedIn. But how do you do that listening through social media? And how do you find your target group? And how do you ensure that you are found earlier than your competitor? How do you connect in a professional manner with the highest possible acceptance and how do you maintain this contact? In short: how can you optimally use LinkedIn for sales and lead generation? Your headline is perhaps the most important of your LinkedIn profile and determines whether or not someone opens your profile. What does your headline look like? Is there still Account Manager at company X? This says nothing to a potential customer. There are so many account managers in this world and what are you different from those others? "My promise is Z, so that you can do as XY"
X is your specific target group, Y is what you have to offer and Z is what it delivers to your customer. Are you at the top of the search results? Are you found on the right 'keywords'? The secret of success on LinkedIn is to ensure that you get to the top of the search results and you can do that by formulating good 'keywords' and then placing them in strategic locations in your LinkedIn profile. 'Keywords' are search terms on which you want to be found. Formulate at least five words that describe you and distinguish you from others. Also check out which key keywords your main competitors are targeting. Process these keywords at least in your headline and in your summary. The summary is the most relevant part of your profile after your header. In this you describe who you are, what you do and how you can help. Be careful not to write your summary as a CV. People want to know who you are, so tell about yourself and how you can help others, in other words: your value proposition. A 'call to action' can also not be missed. And do not forget to mention your contact information so that people can contact you directly if they want to.